NYC, 02/13/2019, 11:30AM. 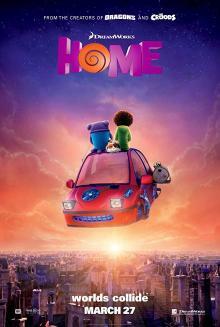 Home (2015): 3D animation starring the voices of Rihanna, Jennifer Lopez. 94 min. Director: Tim Johnson. Starring Jim Parsons, Rihanna, Steve Martin, Jennifer Lopez. Home grossed $177.4 million in North America and has grossed $208.6 million in other territories for a worldwide total of $386 million. Besides lending her voice to the film, Rihanna also created a concept album of the same name. The soundtrack includes guest vocals from Jennifer Lopez, among others, was supported by two singles, "Towards the Sun" and "Feel the Light".